Happy New Year! I can't believe how long it has been since my last post! Time and life got away from me for awhile, but I am back and here to stay. There is a lot to catch you up on, and while I would love to do it all in this post, it would make it a very long post! To start things off again I thought I would share a recipe. To be honest, this is not my recipe, I'll point you all in the direction of where I got it, but I will share how I like to "dress it up" and make it my own. 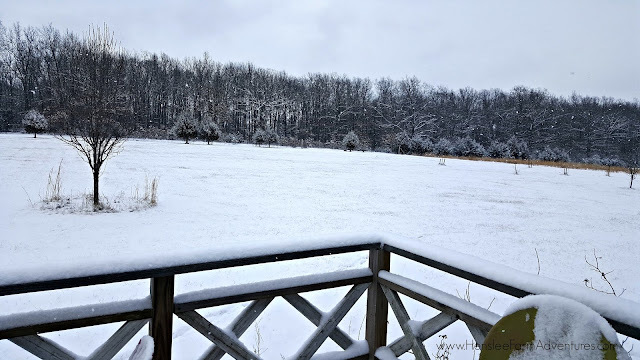 A cold snowy morning on the farm. The recipe that I want to share is porridge! Specifically millet porridge. 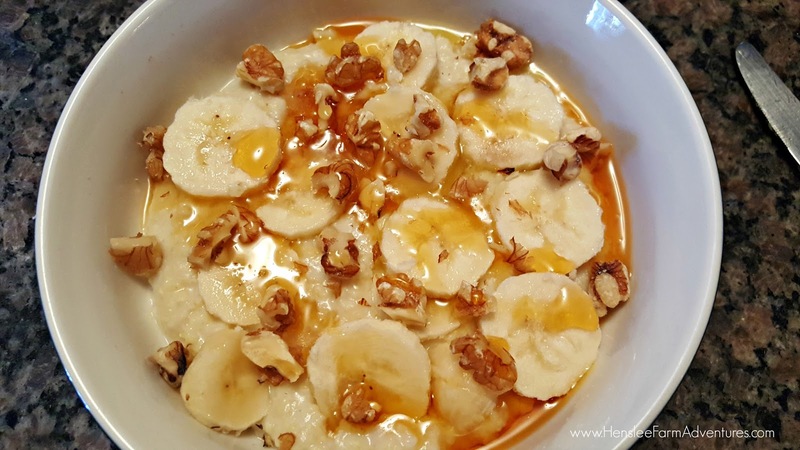 Is there anything better on a cold winter's morning than porridge? Just the sound of it warms me inside. It is so Dicken's, so Oliver-ish (please sir, may I have some more?). Usually our family eats oatmeal. We all like oatmeal except for my husband... he loves it. In fact my husband has an attraction for oatmeal that borders on the insane. Growing up he had to have it every morning for breakfast. As for me, I couldn't stand oatmeal when I was little. It was a texture thing. However, as I have gotten older (and cooked it myself) I began to like it, but I am pretty picky on the consistency of oatmeal. I like it creamy and more like mush (soft), while my husband likes his chewy. Nevertheless, we have been able to push past this disagreement and somehow make our marriage work. Until recently I had never had millet. We were at our friend's house for a New Year's eve party and we started discussing ancient grains. I know what you are thinking, and yes, it was quite the wild party! ;-) My daughter Carly has bowel issues. We thought it was just dairy and now it may be wheat as well. 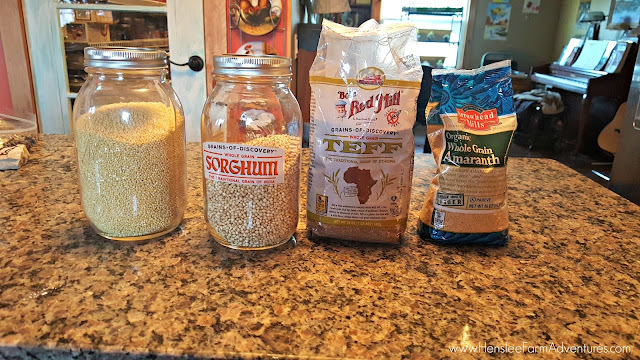 Our friends (who are amazing I might add) gave us several different grains to try that are all gluten free. We ended up bringing home millet, sorghum, amaranth, and teff. (Check-out my instagram @hollihen to see a picture of the sorghum we popped that night). The ancient grains we got from our friends. Of course I started looking up recipes right away, plus looking at the recipes on the packages to see how I could cook these. These grains can be used in just about anyway you can possibly imagine. 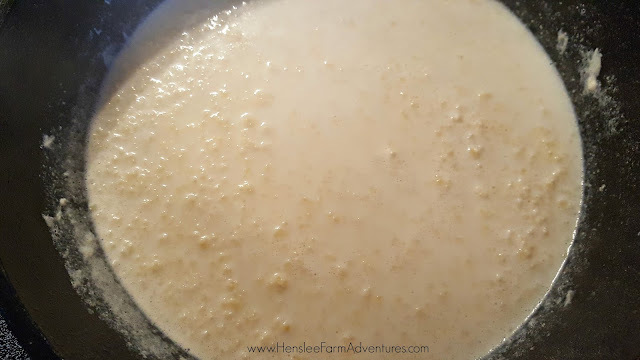 I decided to go easy the first time and make some porridge out of the millet. What a great way to start! I am completely in love and now I have a better understanding of the relationship that my husband has with oatmeal. 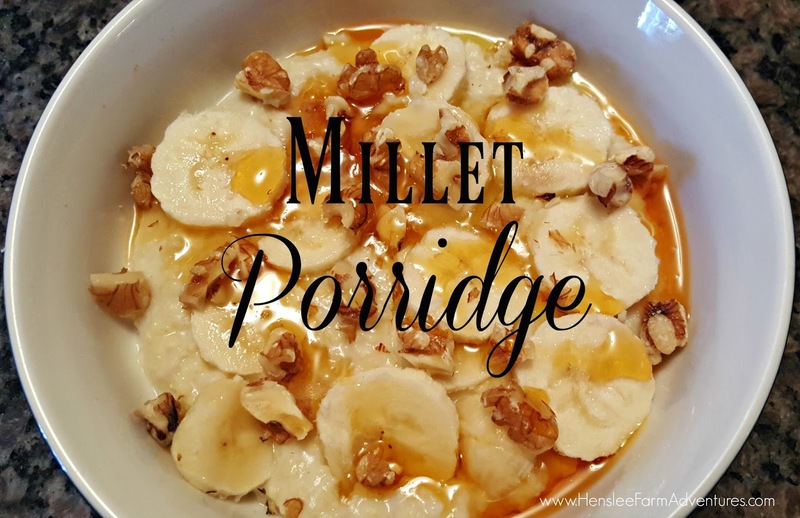 I might just end up having the same relationship with millet porridge. The recipe that I used for basic porridge I found over at the site Delicious as it Looks. 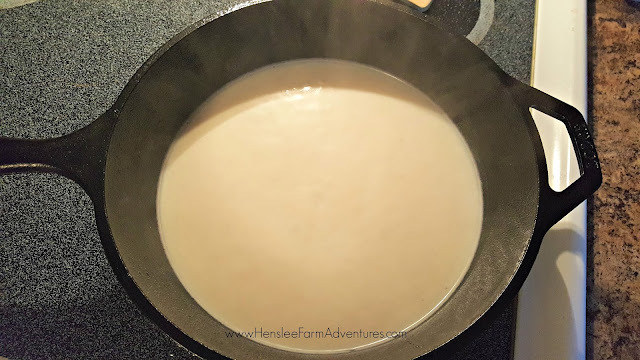 The ingredients are very simple: millet, water, milk, and salt. For our family I used almond milk. Our poor girl can't even digest the lactose free milk, so almond it is. For the salt, I use pink Himalayan salt. 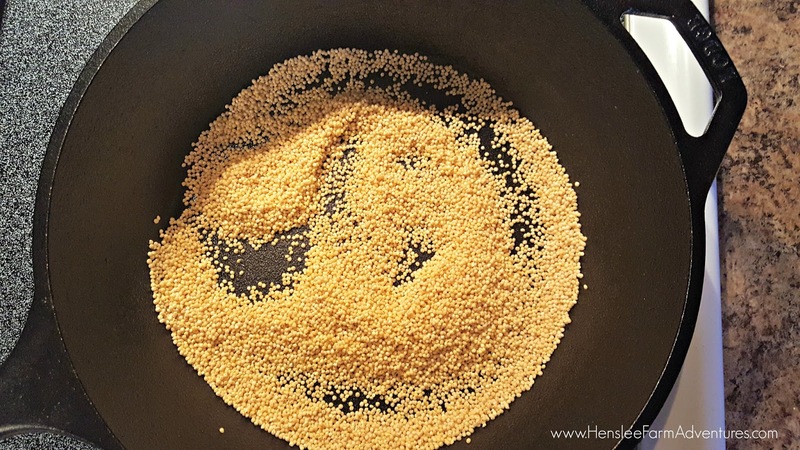 Millet toasting in the pan, so pretty! Here is what I did a little differently. First I toasted the millet in the pan. It helps give it a nutty flavor. I then added the liquid and brought to a boil. Water and milk added, and I promise the millet is in there too. Then I turned down the heat and let it cook covered for 25 minutes as directed. 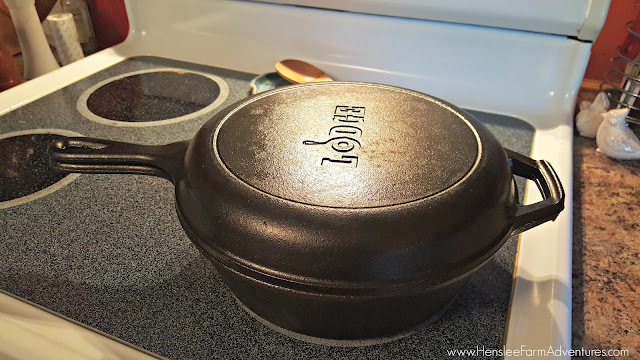 I love my cast iron pans! You can see what it looked like after I took the cover off. It was a little too liquidy for my tastes, so I continued to cook for an additional 5 minutes with the cover off. After cooking for 25 minutes, this is before I let it thicken up a little. It really does thicken up quite quick and when you let it stand, it will continue to thicken. I first put a pat of butter in the porridge and let it melt. I had to sample this and it was the most creamy, yummy, thing I have ever eaten. BUT while it was good just like that, I had to put in my own add-ins. Walnuts, banana, and pure maple syrup... yum, yum! 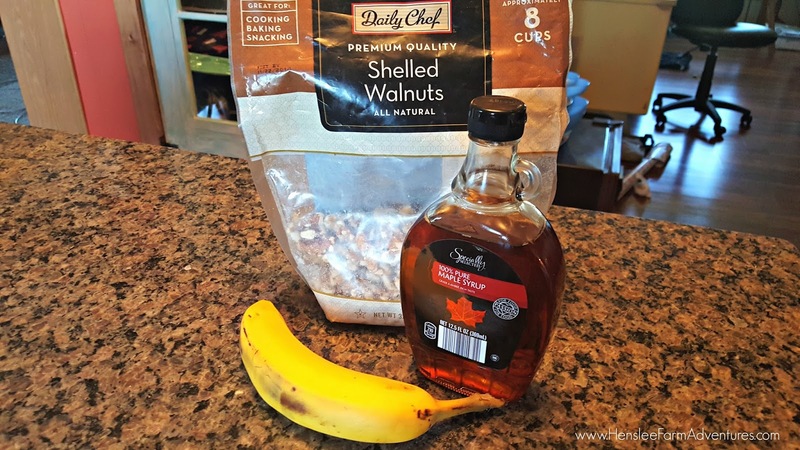 I added in sliced banana, chopped walnuts, and then drizzled maple syrup over the top. It was to die for! I can't even begin to tell you how yummy this was! I am so glad I made a huge pot of this. I put the left-overs in the fridge and I plan to eat some more for breakfast the rest of the week. The finished product. So good!! Another good add-in idea would be chopped apples, cinnamon, pecans, and honey. I am so glad that our dear friends gave us this grain, and I am so glad to find the recipe and my new found love affair with millet porridge! Tell me...have you ever tried millet porridge? If so what do you add to it?